Yesterday's photo of a roundabout cage wasn't exactly an Abbasidian aviary. It wasn't, as we fantasized, a leftover space re-landscaped into an urban ecological hotspot. As pointed out by a reader, it's the Quatre Pavés Water Tower (1971) by Pritzker Laureate Christian de Portzamparc. In any case, it reminded us of an entry to the 2005 Chicago Prize competition, which sought fresh ideas on how to repurpose Chicago's ubiquitous water tanks. Submitted by John Snavely, Sarah Dunbar and Stephen Perdue, it proposed converting these pointilist urban artifacts that still pockmark the city's skyline into a sort of neo-Olmstedian necklace of mini eco-parks for endangered migratory birds. Chicago is an important stop along the Mississippi Flyway for many bird species during their yearly migrations. This contiguous, low-lying route unbroken by mountain ranges from the Arctic coast of Alaska south to Patagonia has been instrumental in developing migratory paths for various species. 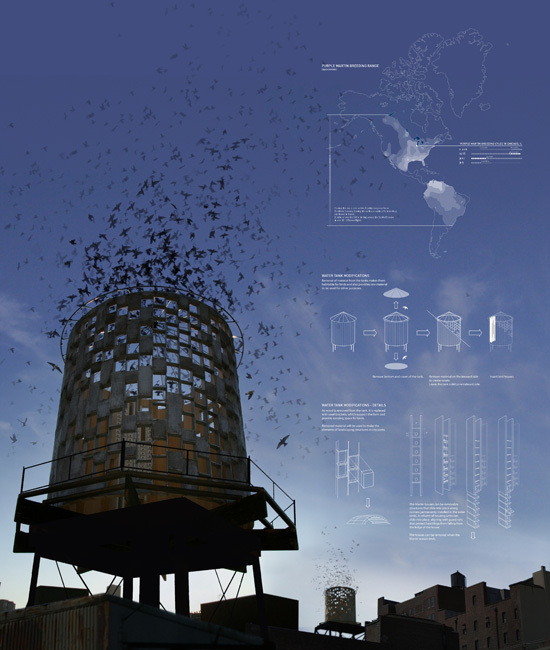 Adapting Chicago's water tanks for a new function is a unique opportunity to create a habitat that will enable an endangered bird to safely breed in the city. The Purple Martin, a large songbird who migrates south each year along the flyway has lost its entire natural habitat east of the Mississippi and nearly all of it west of the River. Martins are social birds who readily roost and breed in man-made houses. Given the loss of original habitats, Chicago can use existing infrastructure to connect to the flyway in such a way that birds better inhabit the city - making people aware of its critical relationship to the larger natural environment. It's somewhat similar in concept to the second prize winner, but this one caught our greater attention because of its renderings of birds shooting out from the tanks, as though uncorked after many restless years in captivity. For us at least, this image calls to mind any of the staple PBS nature documentaries showing millions of vampire bats whizzing out of their subterranean dwellings soon after the sun has dipped below the horizon. Across a fast darkening sky, darker clouds throb and shudder. 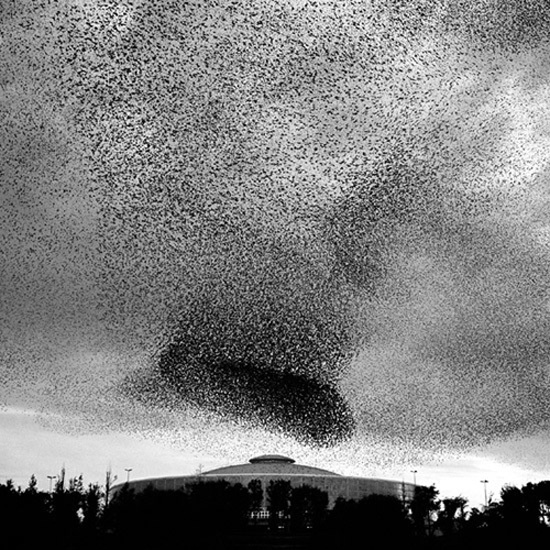 And it also reminds us of Richard Barnes' grotesquely marvelous photographs of European starlings “murmuring” in the skies over Rome. Surely one must now be wondering whether these self-organizing bio-troposheres could be choreographed in the skies over Chicago. Orphaned birds have been successfully taught forgotten ancient migration routes, even new ones, so why not imprint other behaviorally malleable birds to cultivate a sort of amorphous topiary sky garden. It would be like landscaping the ethology of an urban ecosystem. 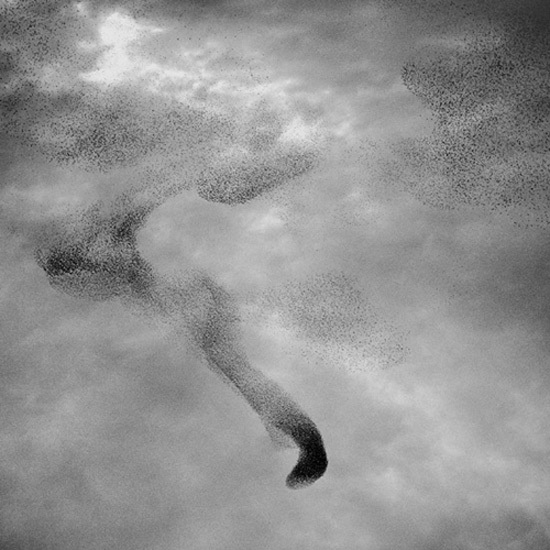 With the ringing of a bell or some other trigger, the birds would surge out in torrents from their rookeries. With another ring (or perhaps guided by one or two oozological agents reared by Natalie Jeremijenko), they will then start to perform their aerial ballet, vacillating between chaotic noise and sensuous shapes, between turbulent instabilities and structured systems. A living fog sculpting itself with its own meteorology. Reflecting the yellows and the ochres and the oranges at sunrise and sunset, the whole scene will surely look like a Turner painting. Hack into Jeremijenko's ooz-birds and you can control the flock. Direct an avant-garde staging of The Birds or Mary Poppins if you want. Or do a little bit of guerrilla sky gardening. With the rising popularity of urban farm animals, perhaps these chickens and honeybees and miniature cows and even the city's existing menagerie of sewer rats and flying rats (and let's not forget the cats and dogs of gentrified inner neighborhoods) can be conscripted and turned into trained acrobats. Or are they all together already performing one unending gigantic urban show for us humans? Great imagery by John Snavely et al. 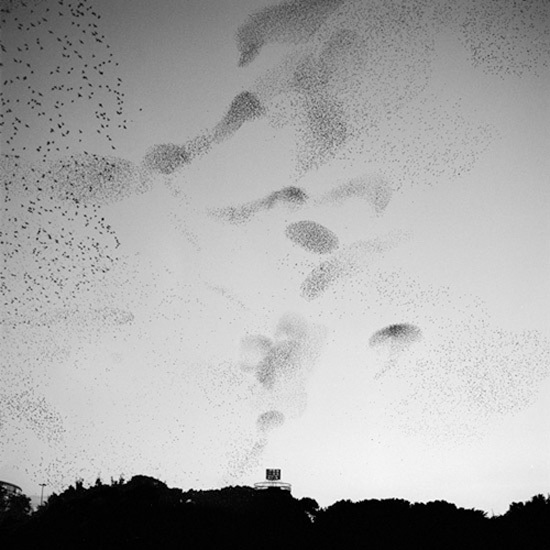 (Migratory Habitat, 2005). The "avian turners" could be installed in cities throughout the various North American flyways. NYC has its share of water towers (http://localecologist.blogspot.com/2009/07/all-along-houston-water-towers.html). 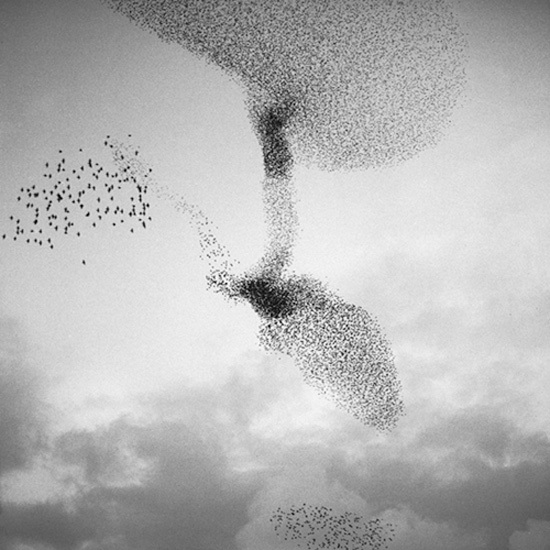 That photo of the starlings is stunning. I think everybody but the residents nearby would love the idea! I love the old water towers that dot the roofs of New York, Chicago and other American cities. There is a great one on the roof of the new architecture building for the University of Oregon Portland program. Any idea that involves preserving them or even the adaptive reuse of them is fantastic. Especially if it is providing habitats for migratory birds and other endangered species. Another wonderful post. The juxtaposition of architectural intervention and art is great to see.